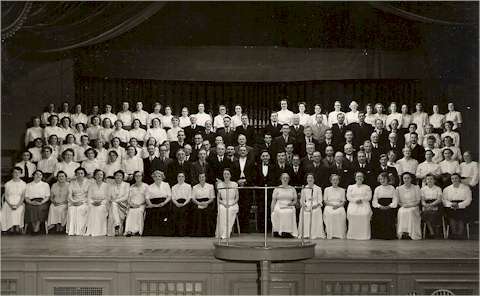 The Wycombe Philharmonic Choir, although not always known under that name, has its roots in 1951. In that year, there was a choral collaboration to perform a concert in Wycombe Town Hall to celebrate the Festival of Britain. This led to the formation of the Wycombe Free Church Choir, which was part of the national Free Church Choir Union for many years, regularly taking part in National Choral Events at the Royal Albert Hall in London. Always a substantial mixed choir, the Free Church Choir soon developed a reputation for excellence under its Musical Director, Kenneth Fox, who led the choir from its early days until the 1970s when he handed over the baton to Denys Hood. Denys continued as Musical Director of the choir for some 30 years, expanding the choir&apos;s repertoire to include folksongs, spirituals and light music as well as classical works. It was during his tenure that the Choir changed its name to the Wycombe Philharmonic Choir. David Cooke, who has been the Musical Director since 2003, has led the choir in further expanding its repertoire thus enhancing reputation for high quality performances in varied musical styles. We welcome any singers who&apos;d like to become part of this outstanding musical experience.